Axel Schultes (born November 17th, 1943) is a German architect from Dresden. He is is one of the principals of Sultes Frank Architekten in Berlin. Schultes studied architecture from 1963 to 1969 at the Technical University in Berlin. Together with Dietrich Bangert, Bernd Jansen and Stefan Scholz, he founded the practice BJSS in 1972. In 1982 he founded a new practice with Charlotte Frank and Christoph Witt orignally named Axel Schultes Architekten, now Schultes Frank Architekten. Since 2003 Axel Schultes is teaching at the Kunstakademie Düsseldorf. Axel Schultes is well known for his 1993 winning competition design for the "Spreebogen" in Berlin, a focal area for the development of Berlin after the fall of the wall with the new chancellery at its centre. 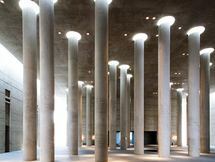 In a subsequent competition Schultes and Frank also won the competition for the construction of the chandellery (Bundeskanzleramt) which was completed in 2001. Schultes repeatedly voiced his concerns about the implementation of his design proposal for the Spreebogen describing it as piecemeal.